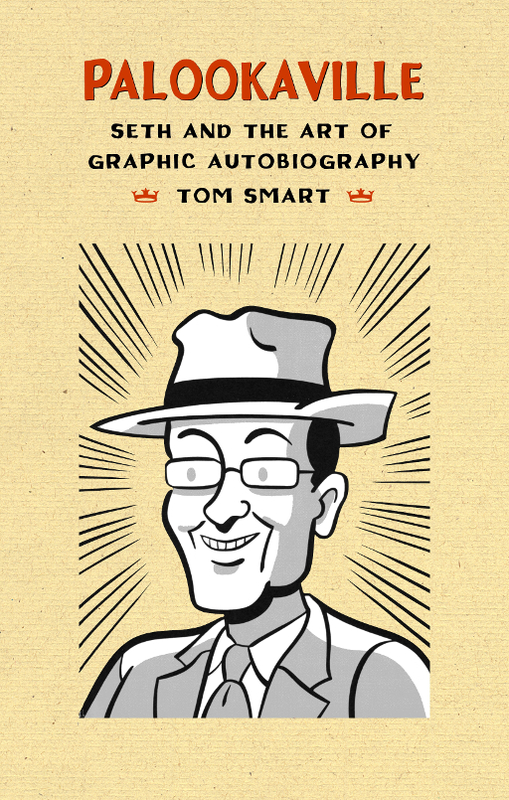 Tom Smart’s Palookaville: Seth and the Art of Graphic Autobiography examines the construction self-identity and the wafer-thin distinction between fiction and autobiography in Canadian cartoonist Seth’s Palookaville series of graphic novels. Seth (the pen name of Gregory Gallant) has been the subject of a documentary, designed The Complete Peanuts series by Fantagraphics, provided images for Lemony Snicket’s books, and has had his work featured in The New York Times Magazine and on the cover of The New Yorker. Despite his professional success, the artist himself is something of an enigma—dressing in suits and hats from the 1950s and disdaining most cultural inventions past that time. As Smart writes, "Seth can ... be described as a sophisticated performance artist who cloaks his artistic practice in the garment of a cartoonist and illustrator." Palookaville examines the man and his work, and the often-thin membrane that seems to separate the two. The book’s title, Palookaville, comes from Seth’s ongoing comic book series of the same name, and the term "palooka" was popularized by its use in a 1930s American comic strip. This term is, in its way, representative of Seth’s preferred vision of life—one from the twentieth century, not the twenty-first—but also of his method. Seth is profoundly influenced by his love and study of American and European cartoonists who came before him. Like the visible tip of an iceberg mostly hidden by water, what Seth produces on a page is intimately connected to his love for the work of these artists, as Smart explains. Some questions remain frustratingly unanswered: for example, Smart posits the idea that Seth himself may have authored several of the letters from fans posted in issues of the Palookaville series. He notes that Seth has denied these claims, but instead of a direct quote, it’s attributed in a footnote, without further comment: "Email to author, January 6, 2016." It would have been more interesting to read Seth’s reply verbatim, and at times it’s frustrating that Smart is unable to simply have his subject clarify certain aspects of his own work. It must be assumed that this is because of reluctance on the part of Seth, not Smart, because Smart seems to make every effort to fill in the blanks using his own devices. Thus, Smart writes lines like "Seth has never been explicit about why he chose such a name [Palookaville] for his comic book," and he valiantly theorizes about the origins of the pen name Seth. ‘Having only read a little bit of Seth’s work and not overly familiar with the Palookaville series, this book was an excellent dive into the author’s introspective work, style and influences. Smart does an excellent job of walking the reading through the history and evolution of not just Palookaville, but also its readers and the impressions that the series has left on them. Well laid out and illustrated with poignant examples of Seth’s work. A solid read for both fans of Seth and Palookaville, or for those (like myself) who are curious to discover more about one of Canada’s leading graphic artist. 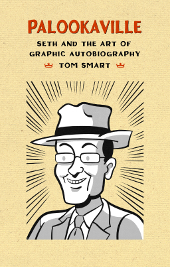 ‘[Tom] Smart, a gallery director and curator, has turned his well-calibrated critical lens onto the work of Seth’s multi-volume work Palookaville, and in so doing has articulated what so many already know, and hopefully others will soon realize: that Seth and his contemporaries, including Chester Brown, are artists whose work is equal to that of artists in other mediums who have rendered, and continue to render, Canadian life in exquisite detail. Seth, who lives in Guelph, Ontario, is an artist, author and cultural commentator, and one of the foremost graphic novelists working today. His unparalleled technical skills as a draughtsman and his unique ability to evoke an entire imaginative world based on a mythical mid-twentieth-century small Ontario town rank him as a gifted storyteller and part of a distinguished line of Canadian graphic designers. But Seth can also be described as a sophisticated performance artist who cloaks his artistic practice in the garment of a cartoonist and illustrator. He is intent on examining the malleability of the comic book format to probe the nature and shape of time, and the many different ways that loss and longing can cloud one’s memories of the past. His is an artistic practice that is entirely holistic. In his life he has immersed himself in the fashions, trappings, design motifs and manners of a mid-twentieth-century man. Just as the world he lives in echoes the past, so the world he describes in his art resonates with the same voice; this world has a fundamental integrity. Every detail is set down deliberately and with the intention of crafting an artistic reality that is true to what he sees as a period in Canada that existed perhaps a generation before he was born. His parents’ time holds an uncanny allure for him, and he takes great pains to evoke it in the panels of his comic books, on the surfaces of his illustration boards and in the miniature buildings and streets that comprise his fictional southwestern Ontario town called Dominion. 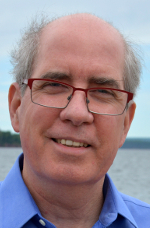 Art curator and author, Tom Smart has written many award-winning books and organized numerous exhibitions about Canadian and international art. He has worked in art galleries across Canada and the United States, including the Frick in Pittsburgh, the Beaverbrook Art Gallery, and the McMichael Canadian Art Collection, where he was its executive director. His monographic exhibitions on east coast Canadian Realists—Alex Colville, Mary and Christopher Pratt, and Tom Forrestall, among others—opened new avenues for understanding this important art movement. While at the McMichael, Tom broadened its exhibition mandate to embrace First Nations art and artists, was instrumental in developing its acclaimed Ivan Eyre Sculpture Garden, and commissioned renowned author Ross King to write a historical portrait of the Group of Seven that was published in 2010 as Defiant Spirits. Currently, as art curator and supervisor of education at the Peel Art Gallery, Museum and Archives, Tom is working closely with many First Nations artists from Manitoulin Island, among them James Simon Mishibinijima, Ann Beam and Anong Beam, and also with Sikh artists, among them the England-based Singh Twins. Tom’s many publications with the Porcupine’s Quill treat the relationship between poetry, printmaking and the book arts (Fabulous Peculiarities, a consideration of Tony Calzetta and Leon Rooke’s Fabulous Fictions and Peculiar Practices, which was adapted for the stage), journal writing and painting (Jack Chambers’ Red and Green and Christopher Pratt’s Thoughts on Driving to Venus, adapted by David Ferry as an innovative staged reading at the Writers at Woody Point Festival), and graphic novels and wordless narratives (Palookaville: Seth and the Art of Graphic Autobiography, on the work of comic artist Seth). Tom has written extensively for the Devil’s Artisan on printmaking, the graphic arts and drawing, including on the art of George Walker, Seth and Rosemary Kilbourn.